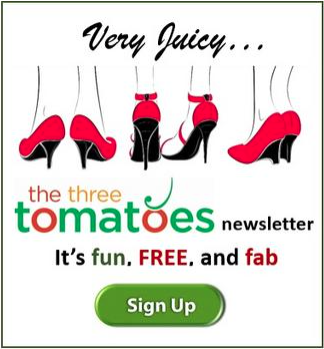 I’ve abandoned the chopsticks to slide a spoonful of tomatoes into my mouth. What is this icy sweetness, this luscious shock? I check the menu hidden on my lap. Preserved plum in shards like granita. I must have another taste before passing the bowl along. A wok-seared Long Island duck breast, jicama and peanuts go into this spicy Kung Pao stirfry. I need to pause before tackling the spooky dark green of the 1000-year-old egg. But it’s surprisingly mellow, fanned out alongside the soft, almost trembling tofu, its creamy texture like a soy-tinged panna cotta. Gifts from Chef Pichet Ong in the kitchen. 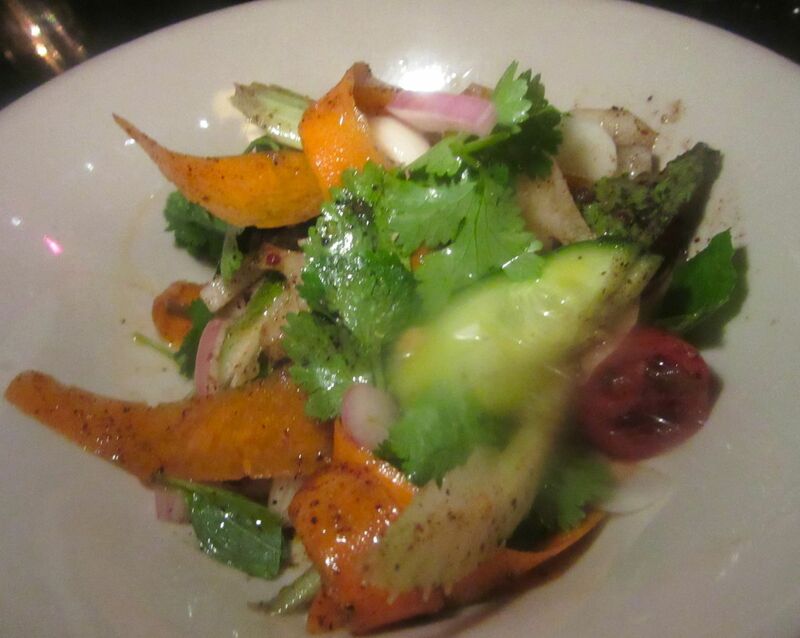 Don’t come here if you plan to be offended by playful twists on the familiar. 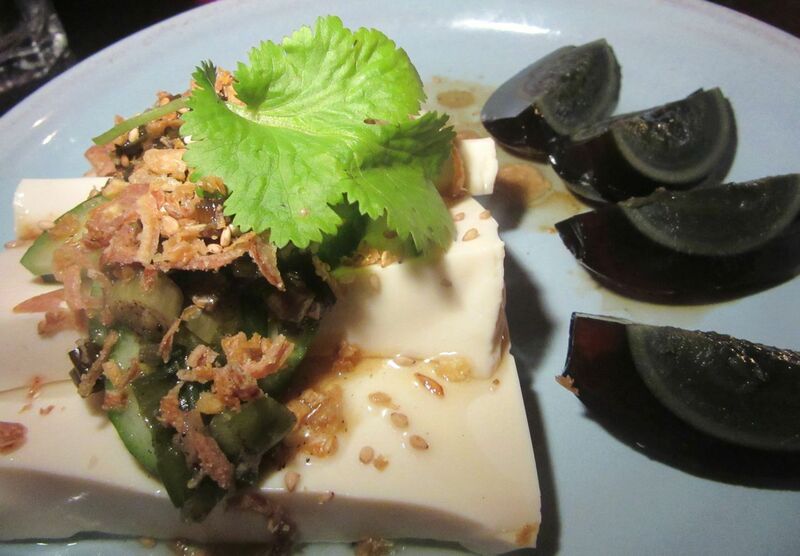 Delicte soft tofu like a lush panna cotta is served with a mildly flavored 1,000-year-old egg. When I think of Ong, I think sweet. I first became aware of him with his unique desserts at Spice Market. And I still long for his homey, American diner-style cakes that were a sweet climax at the Cuban cafe Coppelia, and then disappeared when he moved on. 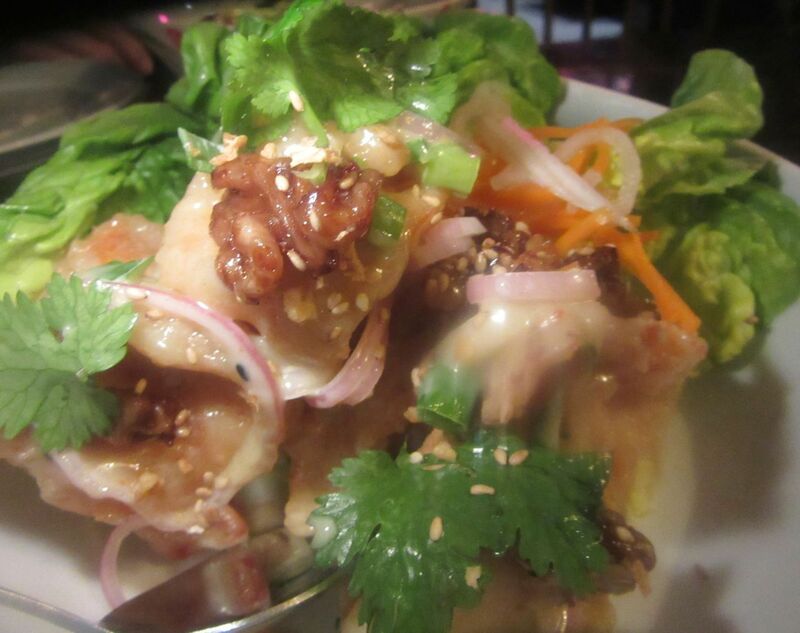 I laughed at the white marble and electrified crystal candelabras as I scorched my mouth with his fiery Thai notions at Qi Bangkok Eatery, nestled into the residual sleaze of Eighth Avenue. Ong does get around. 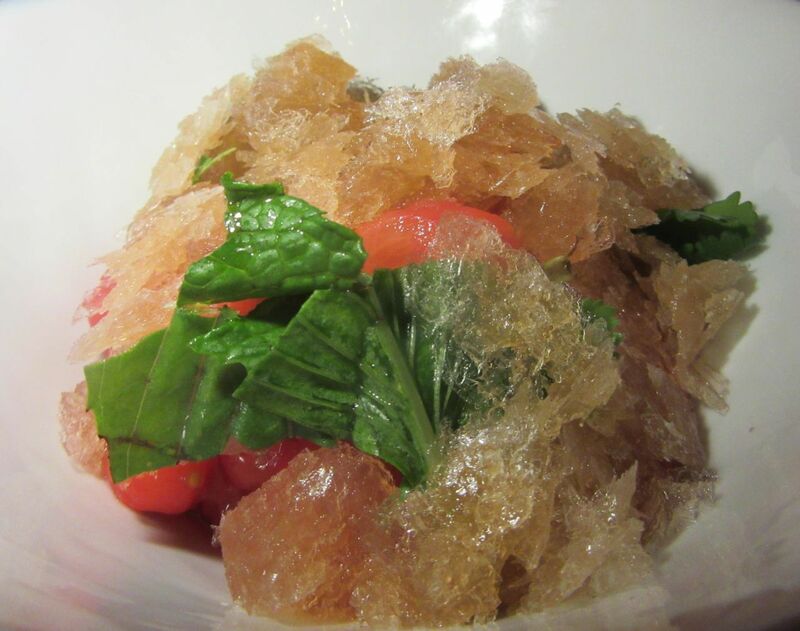 I’ve never tasted anything quite like these brilliant confit tomatoes with preserved plum granita. Now his peripatetic wanderings have brought him to Chaan Teng as “creative consultant,” turning out a unique mix of real and fanciful Chinese dishes for executive chef Erik Bruner-Yang, based in Washington, D.C. I assembled friends very early, surprised how easy it is to get a prime-time table. Is that a whiff of snobbery in response to the address in this low-rent corner of Hell’s Kitchen? Does the place look surprisingly gorgeous? One of the partners is an interior decorator. The door is very heavy. And the hostess doesn’t want to seat us until all of our party arrives. There is no liquor license, a fact that no one thought to mention on the phone. The bartender suggests tea or soda. (Chaan Teng means teahouse, after all, I later discover.) My companion offers to explore the nearby wine shop. Once those annoyances are overcome, any residual grumpiness fades, chased by the unusual charm of the setting. 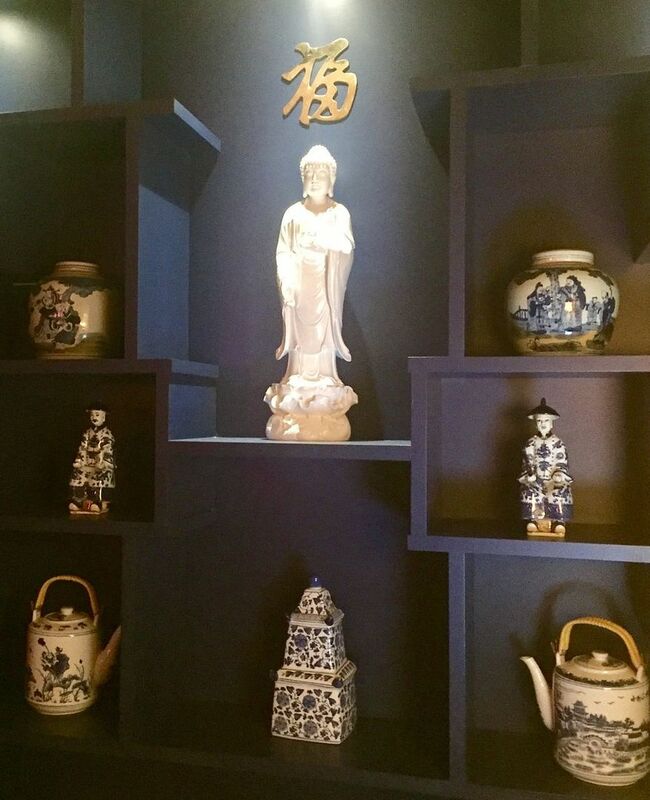 It’s very Tea House of the August Moon, with pierced screens separating tables, blue and white vases on shelves, a porcelain Buddha, old teapots, and other vintage and flea market Chinoiserie. A small, white shaded boudoir lamp and white hydrangeas in a Delft vase sit on the blue and white tiled shelf above our booth. Why is it so gorgeous? One of the partners is a decorator, I am told. 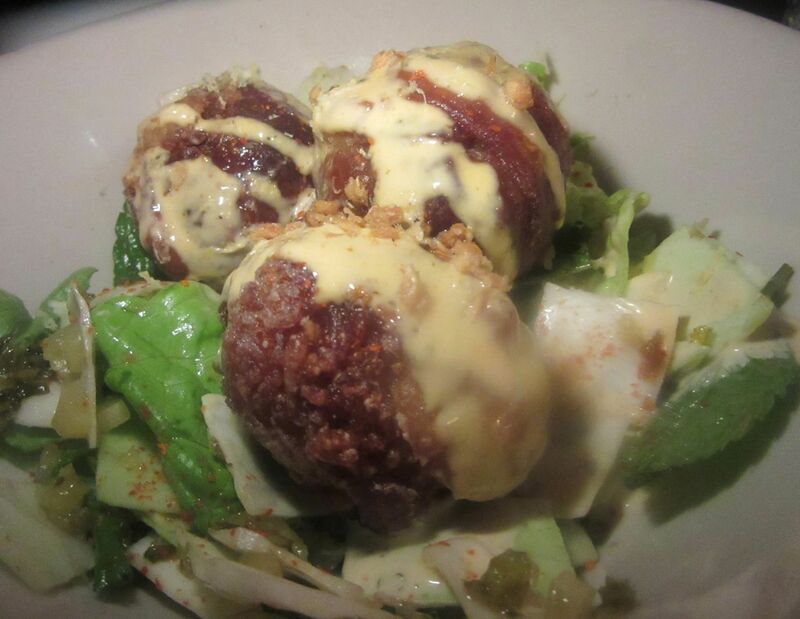 Chicken skin dumplings are formed from sweet tea rice with dried shrimp and painted with spicy mayo. Of course I tend to be pushy, but in this case, with so many unknowns on the menu, my friends are willing to let me dive in and direct. I go for the whimsy, not expecting much from chicken skin dumplings. They turn out to be delicious, soft little balls of tea-flavored rice with dried shrimp, swathed with spicy mayonnaise, surrounded by chunky cabbage slaw. Crab cream cheese with coconut XO sauce is spread onto crispy wonton skins. “Crisp Rangoon Nacho XO” is especially left field. I order it to keep us amused while waiting for late arrivals. 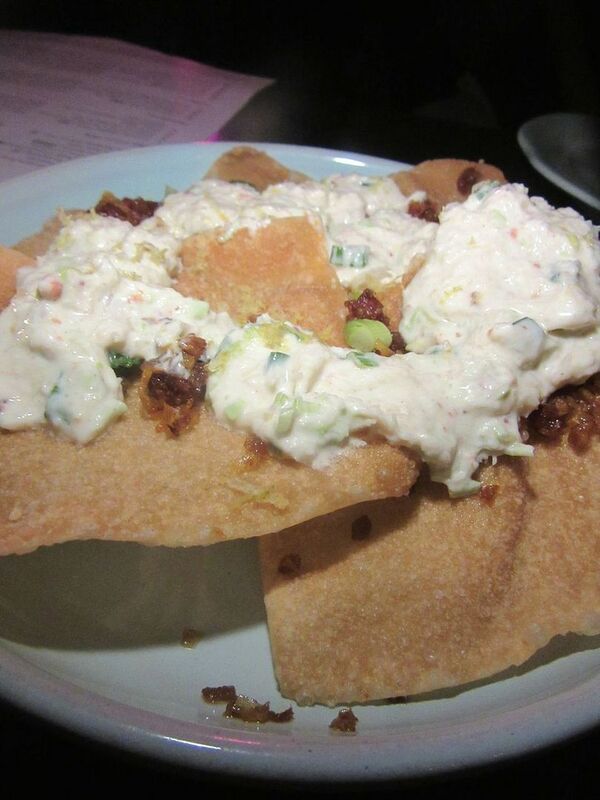 Imagine crab-infused cream cheese on crispy wonton skin crackers with XO sauce. (Typically, dried scallop, dried shrimp, red chile pepper, Jinhau ham and garlic.) One bite is enough for my out of town kin. Yes, it’s weird, and yes, I like it. So there I am finishing it. No surprise that the crunch veggies mala are somewhat torrid. Watch for pepper sign alerts on the menu. Spice loads are indicated on the menu with one to four peppers, so we can’t complain when the “Crunchy Veggies Mala,” turn out to be hot, even if we don’t realize mala refers to the fiery Sichuan peppercorn, ma. For the hot heads in our group, it’s just right. Others cry out indignantly. 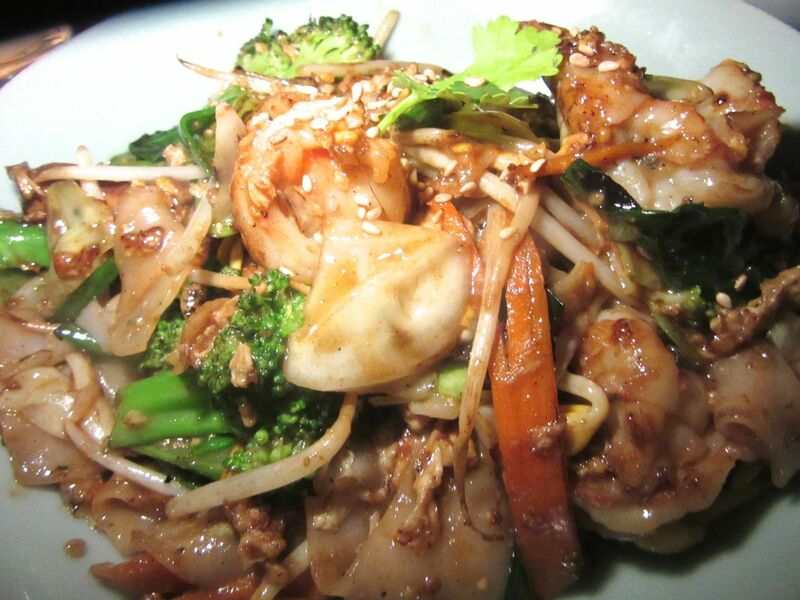 Wild honey walnut shrimp is meant to get wrapped in lettuce. I seem to be the only chile-freak still celebrating when the “Hot Numbing Pork Noodles” arrive. I could have been more of a humanitarian if I’d chosen the chow fun with beef, celery, and Chinese broccoli that stood out both with tofu, and also with shrimp, on a return visit. If numbing noodles are too hot for your buddies, try chow fun noodles with beef or tofu. We asked for shrimp. “Strange Flavor Eggplant” with sesame tofu is meant to be spread, strangely enough, on chunks of toasted baguette. There’s more sweet mayo in honey-walnut-topped shrimp with lettuce — a better dish, we agree, than the mango and macadamia nut shrimp we ordered that arrives later. 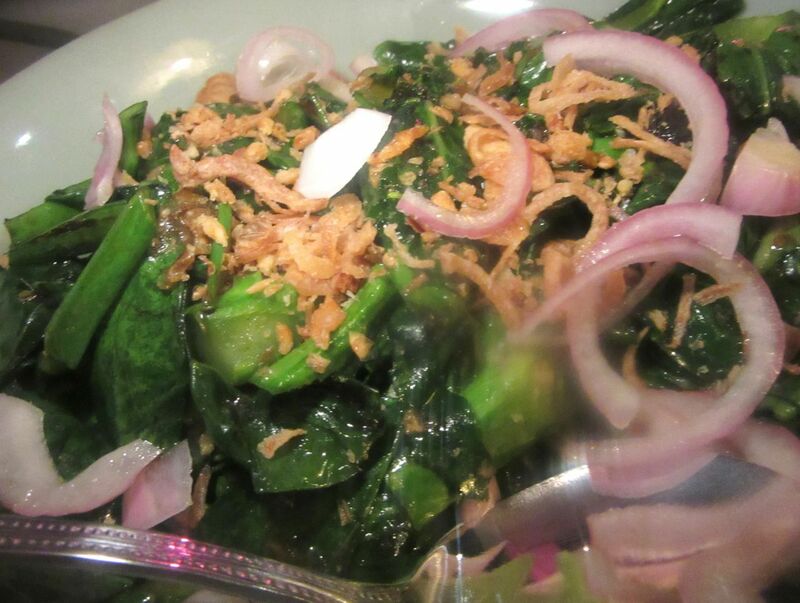 The menu offers market stirfry greens. First time the dish was exceptional. Next time, just boring broccoli. Simple stir-fry greens might vary. On that first night, the greens are exotic and delicious; on the second, just a boring bouquet of simple broccoli. Even if beets are not usually your favorite, you’ll want to try them sprinkled with five-spice, then fried to dip in spicy mayo. A younger generation, brought up on half-cooked veggies, California-style, think these crunchy al dente long beans are perfect, but I disagree. 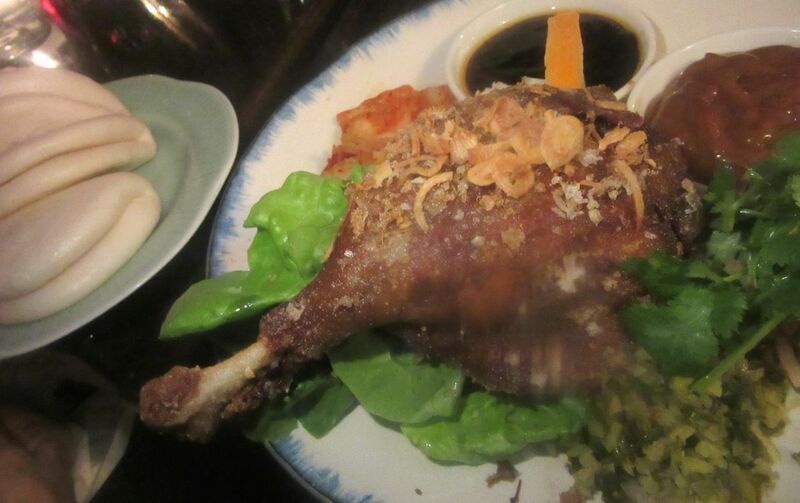 A confit duck leg comes with little buns, Beijing spices, hoisin sauce and lettuces: Peking duck in essence. And it seems odd that the balls of “Singapore Chili Crab Cake, supposedly made with wild shrimp, are almost watery, while the thick sauce they float in is fabulous. The dish is sent by the kitchen so we don’t overlook a “signature,” the server advises. Crisp-fried veggie vermicelli egg rolls with Chinese chilis have a three-pepper kick. The many small plates ($9 to $12) are meant to make Chaan Teng seem more like a Hong Kong teahouse with dim sum. But medium size plates ($12 to $19) and large ($16 to $28) are more like dinner. 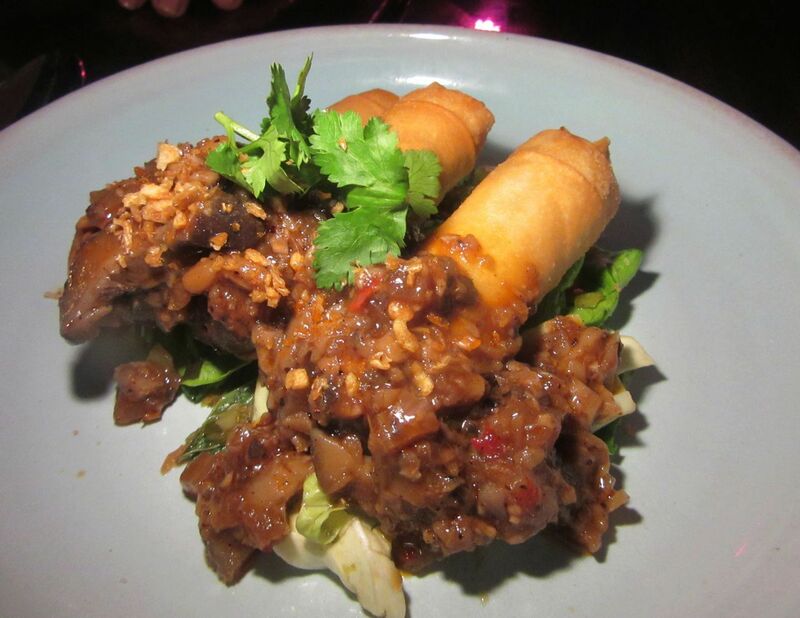 The confit duck leg platter comes with buns, hoisin sauce, and lettuces — essentially, Peking duck. 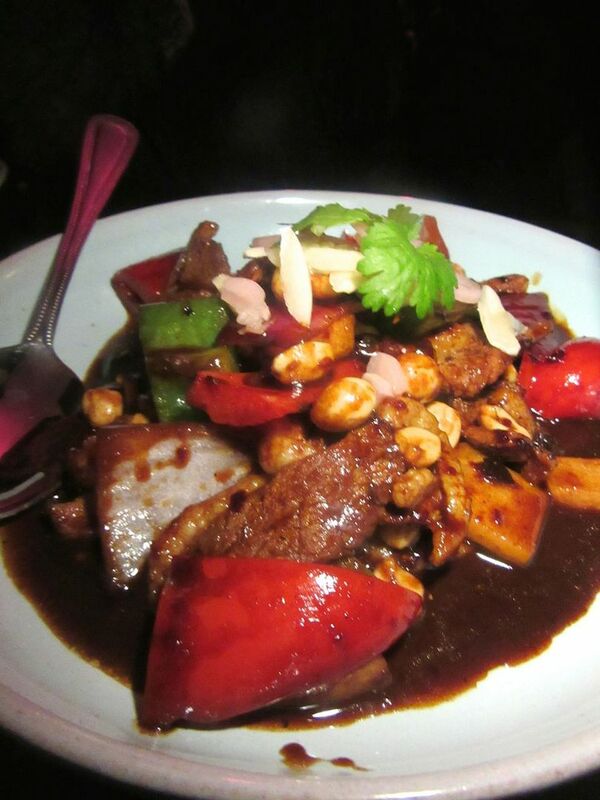 I prefer the spicy seared breast stir-fry of the Kung Pao duck with chilis, jicama, and peanuts. 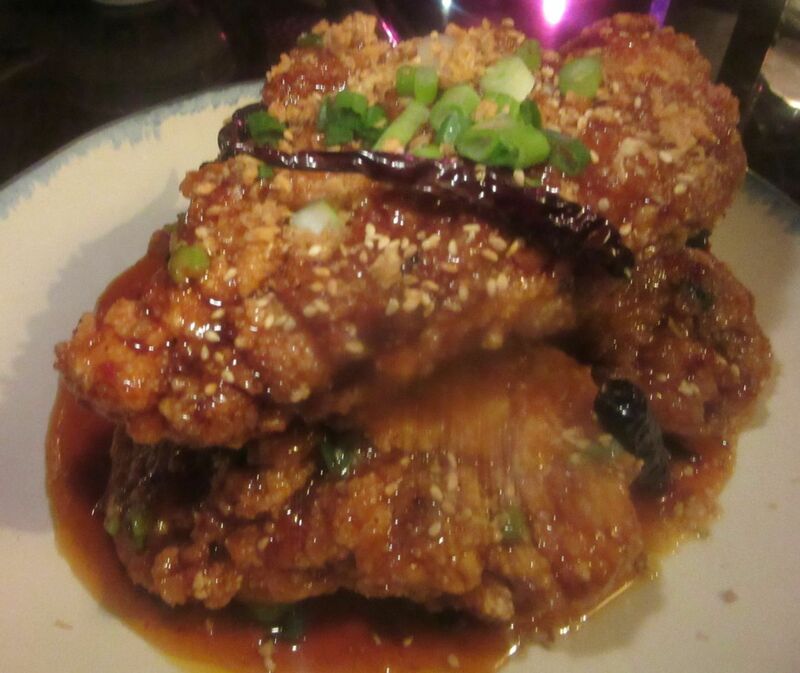 Don’t forget I sent you here for General Tso’s fried chicken (and those tomatoes). Everything else is optional. Even if you’re not on a personal quest for the town’s greatest fried chicken, you should not overlook “Half General Tso’s Fried Chicken.” I never resist Yunnan cumin lamb ribs when offered. They can be wildly hot and cumined so aggressively it tastes like a mistake. Here, the three lamb ribs are gentled with yogurt and very fatty. Five spice and a rubble of chopped, pickled mustard greens elevates the Taiwanese-style pork chop from an everyday schnitzel. But we’ve ordered too much again, so I’ll take it home for lunch. 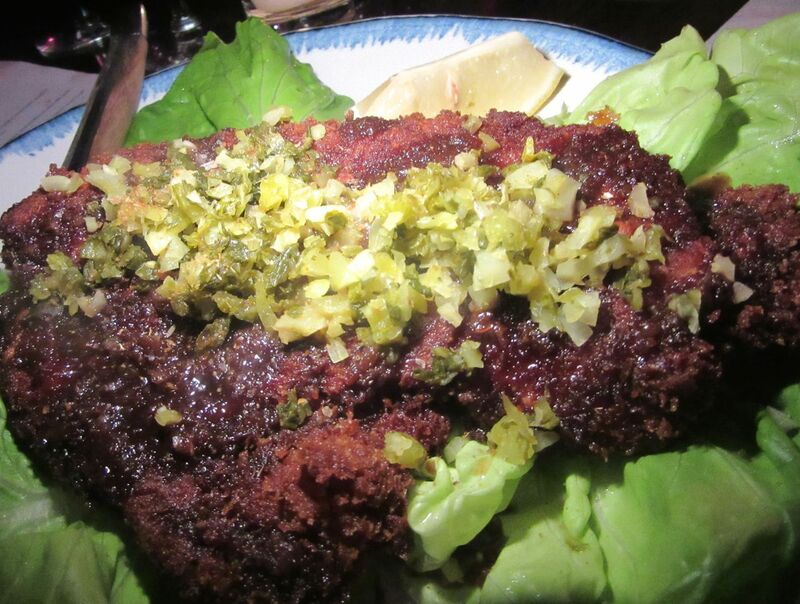 Taiwanese pork chop is like a pork schnitzel, but with chopped, pickled mustard greens. “To good appetite and longevity,” is the dedication at the bottom of the menu. That includes dessert. Chocolate coconut pudding with brandied cherries, perhaps. Green tea white chocolate pastry with orange and homemade whipped creams. 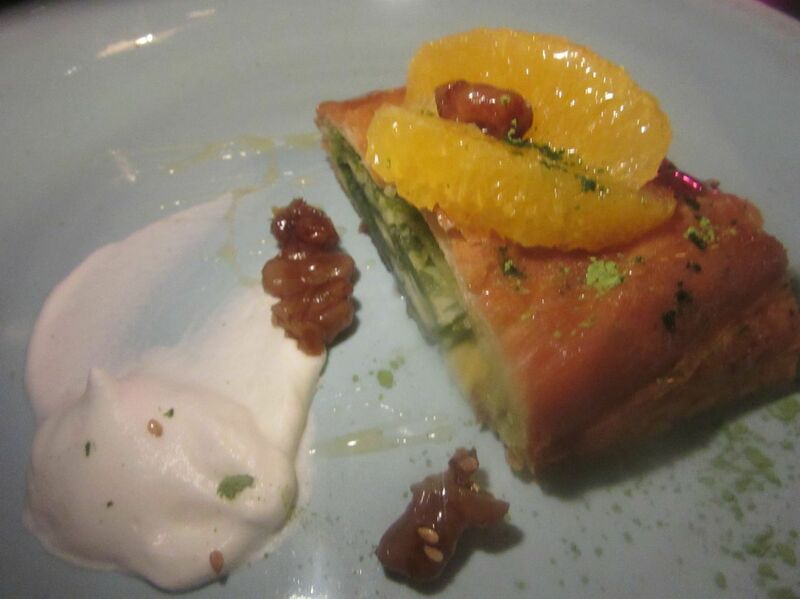 Orange and green tea pastry with white chocolate and homemade whipped cream. Most recently, when clearly we are being wooed by the kitchen, dessert simply arrives: green tea cheesecake with mango sorbet and a ribbon of raspberry sauce. And a chocolate crunch bar with black sesame ice cream. Sweet Ong makes a proper finale, but it’s the topsy-turvy Chinese that will bring me back. Desserts may keep changing. 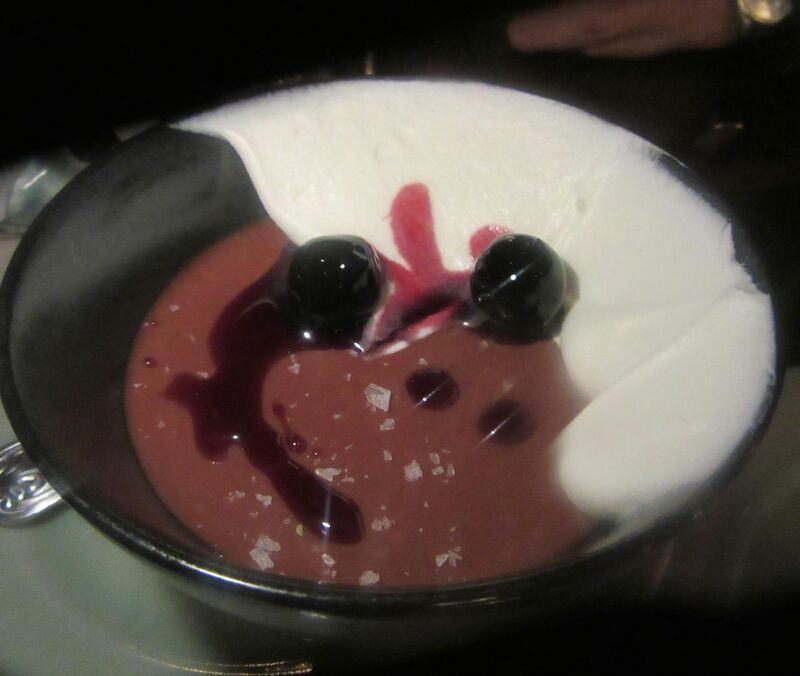 That first night we had chocolate pudding with brandied cherries. 698 Ninth Avenue, SE corner of 48th Street. 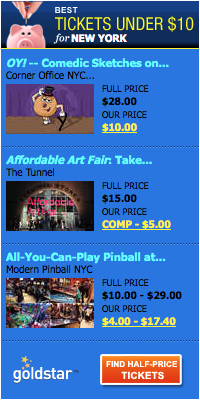 212 235 1886 Sunday to Thursday, noon to 11 pm. 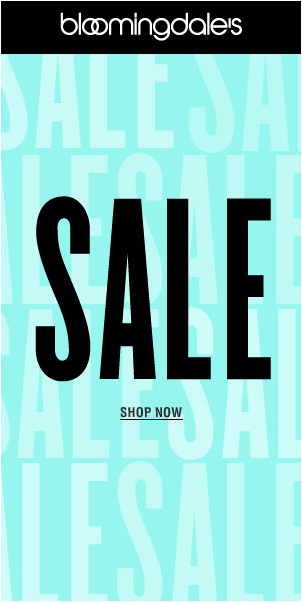 Friday and Saturday noon to midnight.